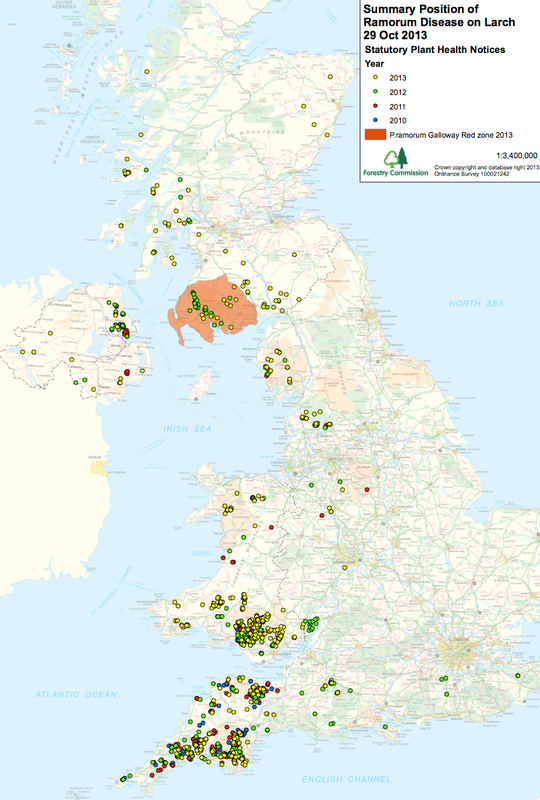 The United Kingdom (UK) Forestry Commission has updated its P. ramorum larch outbreak map (http://www.forestry.gov.uk/forestry/infd-86ajqa) to include Northern Ireland. The map at left identifies areas where there is or has been confirmed or presumed infection in larch trees. Laboratory analysis of samples returns conclusive results in only a minority of cases, so a presumption of infection is used where all the other indications point to the presence of P. ramorum infection. The colored dots on the map indicate sites where P. ramorum has been confirmed or presumed, and statutory plant health notices (SPHNs) have been issued. Each colour represents the April-March year in which this occurred. The Galloway Red Zone in southwest Scotland has also been added to the map. The Red Zone is the region of Scotland where the rate and severity of disease spread is too intense for control through tree felling; consequently, this region will have requirements put in place regarding the movement of infected timber and bark. Control by statutory plant health notices requiring sanitation felling will continue elsewhere in Scotland. For more information on the status of the situation in Scotland, go to http://www.forestry.gov.uk/forestry/infd-9bglrr.